Stores reference 22c/827. The frame is in good condition, undamaged but with some paint loss/chipping. It is interesting to note that the number '674' has been stamped into the frame. Both frame nuts are original, in this case the rarely found white painted type. These are supposed to denote the fitment of prescription lenses but in this case the lenses are of standard laminated glass. The leather surround is sound but has surface wear and the nosepiece has pulled away from the sitches that secure it at the lower edges (easily redone). The backing chamois has average soiling at the sides but the centre brow pad is dirtier. There are a few small holes in the chamois but the padding remains good and pliable. Fitted with a reasonable set of clear glass lenses - they have some delamination marks but no damage. The webbing strap has good colour and retains some elasticity. Most metal parts are free from corrosion. The owner's service number is marked on the strap. 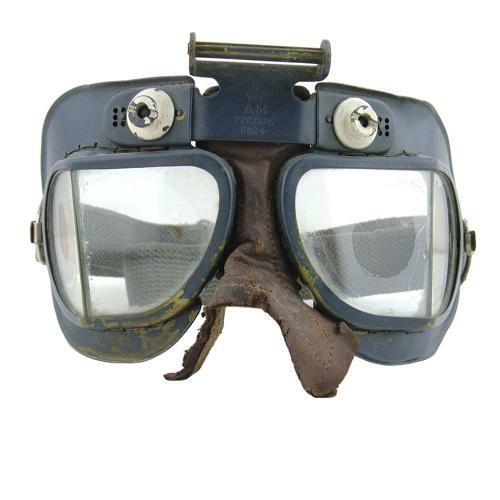 A reasonably good looking used pair of goggles suitable for both RAF and USAAF displays. No antiglare 'flipshield' fitted. Stock code G18366.